Harmony Design & Engineering worked with the Wood River Land Trust and the City of Hailey to develop the Hailey Greenway Master Plan, which was adopted by the City of Hailey in May of 2018. The mission for the Master Plan is to provide a framework that, when implemented, will balance human use (trails, parking, and recreational amenities) with the needs of fish, wildlife, the river, and its floodplain. Three public outreach sessions have been held in order to gather public input on how the Greenway is currently utilized and what future amenities, recreation, and river system management is preferred. If you missed the meetings, watch this short video: "Land Trust and City want your help with Big Wood River Project". The Teton Regional Plan for Sustainable Development was developed as a voluntary "livability roadmap" that can be used by Teton County, Idaho; Teton County, Wyoming; Fremont County, Idaho; and Madison County, Idaho to guide future development. It takes into consideration the common factors between the four counties located in two states, while respecting the varied economic, political and cultural views of each community. Harmony Design & Engineering worked in collaboration with Brendle Group and Logan Simpson Design, both based in Fort Collins, Colorado. Harmony played a key role in reviewing, editing, and providing the local context for this regional plan. The final plan was awarded the Idaho APA Gem Award in 2015. The Pend d'Oreille Bay Trail (POBT) is located on the northwest bank of beautiful Lake Pend Oreille in northern Idaho. The overall goal of the 2015 Pend d’Oreille Bay Trail Master Plan was to help create a trail system that is a model for cultural, economic, and environmental sensitivity and sustainability. These attributes were the guiding elements throughout the planning and design process. The Master Plan by Harmony Design & Engineering provides preliminary engineering design, cost estimates, and an interpretive plan for the proposed extension of, and improvements to, the existing POBT. The Master Plan was created with input from meetings with stakeholders, results from an on-line survey, and public outreach events. the Greater Sandpoint Greenprint (downloadable PDF of the Greenprint Report and the Greenprint Appedices). The 2013 Downtown Master Plan Update for the City of McCall builds on previous City planning efforts and creates a roadmap for future development and redevelopment in Downtown. Public outreach and engagement was at the cornerstone of developing this plan so that it would be based on community values, address relevant issues, and ensure that the public had ample opportunity to provide input, review progress, and shape the plan. The planning process consisted of three phases that coincided with three workshop series. The first part of the process focused on the vision for Downtown and opportunities for revitalization. The second part focused on strategies to achieve the vision and capitalize on opportunities identified by the public during the first phase. The final third phase of the process tied the plan together with concrete action items identified to implement the plan. The plan had broad public support and was awarded the 2014 Idaho APA Outstanding Plan Award and the 2014 Idaho Smart Growth Award. Harmony Design & Engineering worked closely with the County staff and coordinated the consultant team which included AECOM, Jorgensen Associates, and Intermountain Aquatics. Harmony managed the public outreach component of the plan, facilitated citizen committee meetings, wrote several sections of the Plan and coordinated the final composition of the Plan. The Teton County Comprehensive Plan included information on the history of the County, community vision, goals and policies, future land uses and implementation strategies. 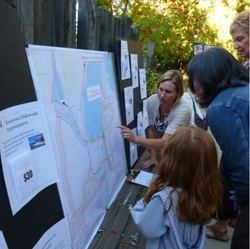 Extensive community engagement efforts included public workshops; open houses; stakeholder interviews; a mobile “plan van;” online surveys; special events; landowner workshops; newspaper articles; and a dedicated website. More than 4,000 comments and other input were received, with a significant portion of the County’s 10,000 residents participating. The plan was unanimously adopted by the Board of County Commissioners in August 2012. In October 2012, the plan was awarded the 2012 APA Idaho Public Outreach Award. The goal of the Blaine County Community Bicycle and Pedestrian Master Plan is to provide a cohesive and comprehensive vision for how it develops, standardizes, and grows its infrastructure, amenities, and policies to support more accessible, safer, attractive, and integrated bicycle and pedestrian use as a transportation mode, form of recreation, and tool to improve the health of the community. Harmony Design & Engineering worked closely with a diverse Working Group, including Blaine County, the Cities of Hailey, Ketchum, and Sun Valley, Mountain Rides Transportation, and the Blaine County Recreation District. The needs for bicycle and pedestrian infrastructure and improvements were gathered using public outreach via mobile workshops at various locations throughout the Wood River Valley, online community surveys, meetings with the Working Group, and one-on-one interviews with stakeholders. The plan has now been adopted by all jurisdictions within Blaine County and was awarded the ​2016 Citizen Advocacy Award by Idaho Smart Growth and a 2015 Honorable Mention Award of Merit by the Idaho APA. The McCall Area Pathways Master Plan evaluates existing conditions, recommends improvements, and outlines implementation strategies to achieve this goal. Design standards and guidelines for trails and pathways improvements were provided and specific short term, mid-term, and long term projects were identified and prioritized. Options for funding of proposed improvements were also included. Harmony Design & Engineering worked closely with the City of McCall planning staff and the Pathways Master Plan Steering Committee in the drafting of this document. Harmony facilitated two, multiple day workshops that engaged the public as well as key stakeholders. The McCall Area Master Plan was awarded the 2013 I-Way Leadership Award which recognizes leadership and innovation for effective coordination of mobility options in Idaho.